It’s no secret that a youthful soul gives the self-belief of being able to grab the world by the horns and shake it up a bit. School is coming to an end and there’s an entire array of options you feel you can pursue and goals you can achieve. When Mark Ormrod left school, he was complete with the same soul. He wasn’t one for the office life in a desk job. His mind and body empowered him to venture for more than the ordinary. His quest for more led him on a path of service, ultimately leading him to finding a home in the Royal Marines. “Straight from school I joined up to the marines,” Mark began. “I was coming to the end of school with my exams on the horizon when I had a bit of an epiphany. I realised that once these exams were done I had to either move on to further education, which I wasn’t too high about, or I had to find a career path. I spent some time looking into various career options and what kind of way I wanted to go. “I knew I wanted something with a lot of variety in it. I knew back then I couldn’t do something that was always going to remain the same. I needed something that would test me. Something that I would be proud of. Something that, if I was to go into a bank and ask for a loan and have to say my occupation, something that would make me feel good to say. “After checking out the police, the army and fire brigade, I eventually decided to go for the Royal Marines,” Ormrod continued. “I chose this because of how challenging it was and the real reputation it has for the longest, hardest training there is outside the Special Forces. Despite the benefits that life in public service or the British Army presented, the gains of being in the Marines were far more attractive to Mark than any of the above. What hooked Mark was the flexibility and not having a normal job. In an open world where you operate on all terrains, it doesn’t take much for Mark to justify his selection. “The Marines work in the desert, jungle, arctic and the woodlands. They can go by land, sea or air. You can specialise in the Marines in any role, like an instructor or a different spectrum like a chef, but your primary role is always as infantry. Whereas in the army, if you’re a chef, that’s all you do. We can specialise in anything and still have the capability to be a soldier and go to war. With his application completed, sent and accepted, Mark was on his journey to be one of the latest recruits. Arriving on site was when it all became real for Mark. Whilst admittedly underestimating the challenge, Ormrod quickly found himself amongst the boys and was ready for the months of training to come. “It was similar to what I expected it to be like, but I think I underestimated it,” Mark confessed. “I knew it was going to be challenging, hard and scary, but it’s not until you get there and you get your bed that it actually hits you. You’re surrounded by sixty strangers, you’re getting shouted at, everybody’s running around naked – it’s just madness. After three years of training, Mark’s first tour of Iraq war zone came in 2003 at the age of nineteen. He was part of Operation Telic – a boots-on-the-ground operation as forces invaded Iraq for the next six years. Making his way over to Iraq was an exciting, but nervous time for Mark. It gave him that feeling to know you’re alive. The very same feeling you want when signing up for the Royal Marines. “This is when we sat in Kuwait and went over the border and invaded Iraq,” Mark explained. “I’ll be honest, at nineteen-years-old, it was pretty boring for a while. It wasn’t what I expected at all. I thought in my head that I’d be going over the border with my knife between my teeth, dodging bullets instead what I was actually doing which was spending three months sat around waiting. “Luckily, we had places to go. As we were with Americans, they’d set up KFC and Burger King stores, so we could get in vehicles and drive down to an American base for entertainment and lunch. When things are slow, most of your time is taken up by admin; taking care of your weapons, checking in with comrades. Inevitably, it would be Christmas Eve of 2007 that Mark’s injury would occur. That morning, Mark and other members of his platoon had been given a brief to partake in a very basic foot patrol around the outside of the campsite. The teams were in two sections; eight men in either squad. Around mid-morning that day, Mark and his squad left for a patrol they had performed countless times. However, this patrol would not finish in the same fashion so many previous duties had. “The idea was to leave the gate of the base at the rear; one patrol north and one patrol south,” Ormrod stated, describing the task. “We would patrol around the camp, looking for anything suspicious and getting our boots out on the ground to chase off the enemy. We’d meet back up at the front entrance and secure that location. It was a really basic patrol. “The stuff we’d been doing before that was, for instance, pushing out the enemy for seven to eight hours a day, so this was only for a couple of hours before we’d come in and take two days off for Christmas. As we were coming towards the end of it, we were coming back to the opposite end of the camp at the front entrance, as we were giving cover to the other section that we left with. “As I went to get next to a box to take cover, I had knelt on an improved explosive device (IED),” Mark divulged. “I wasn’t knocked out by the blast and remember everything that transpired. I was getting down onto my stomach and detonated this device. I didn’t know I’d detonated it because, instantly, there was a big smokescreen created by the sand from the ground, so I couldn’t see anything. “I wasn’t in any pain and only heard the bang. I’d assumed we’d been attacked, so I prepared myself for when the cloud of dust had settled to get into a firefight. As it did settle, I looked around and noticed that my both my legs and an arm was missing. “I’d instantly figured out what I had done. From then on, it was pretty much a race for the lads around me to get to me and save my life. We were only around three hundred metres from the camp, but there was no hospital in there. The hospital was a forty-five minute flight away, so we got back to base and the guys stabilised me and got me to the helicopter landing pad. “That flew us forty-five minutes to the hospital back to a place called Camp Bastion. When we landed at that camp I was knocked out, being the last thing I remember. I’m told I was taken to the field hospital and was amputated on the spot. When Mark woke up those few days later, everything was a blurred, comatose confusion. It took a while for the trilateral amputee to see the full extent of his injuries. Through support from professionals and his family, a relentless process taken tentatively. “You know in the movies when you see a guy in a hospital bed just waking up, seeing the ceiling tiles and the blurry lights? It was just like that,” Ormrod told. “I couldn’t open my eyes properly as they were really heavy. I was focusing all of my energy into my eyelids to try and force them open, but I could hear everyone around me talking and it was all very echoed. “I actually proposed to my girlfriend in the first fifteen seconds from when I woke up, then fell back asleep again. “The doctors weren’t as cut-throat about it and offered support. It meant a lot of medication and, for a couple of days, thought I’d only lost my feet and a hand. I’d have an itch on my chest and I’d relieve it with my right arm even though it wasn’t there, however the pain medication I was on allowed me to assume I had these limbs. Going through such a life-altering situation, dark times are bound to follow. It was up to Mark to prevent these times from controlling his life from here onwards. Three weeks into this new life, Mark was visited in his hospital room by the leading professional in amputation. In thirty-plus years of amputating limbs, he entered Mark’s room and said he’d never be able to walk again. Not only that, but anyone he’d ever met in his years of surgery, the doctor had only ever come across one person with an above the knee injury that had any luck with prosthetics, due to the extremity of pain and energy. This wasn’t what Mark wanted to hear, picturing himself with rock-solid mentality and the desire to overcome his dire injuries. “I went over to an apartment where my girlfriend and her family were staying,” Mark detailed. “They put me into a wheelchair and took me through the communal entrance, but my wheelchair couldn’t get me through any of the rooms in the apartment, so I had to sit in the corridor to eat and stuff. “I had a lot of support from friends, family and the marines, but it was more about focusing on what was available for me rather than what wasn’t,” Ormrod revealed. “Six months post-injury, I walked on the medals parade. That was extremely painful and I had a walking stick because I wasn’t very good. “It took me twelve months to get used to them and that was a pretty grinding process that took a lot of strong will to power through. It also took around eighteen months, maybe longer, to rebuild my strength and physique. “There was a lot of experimenting I had to do with my diet. I used to eat a lot when I was able-bodied. I’d be on the heavy weights, but that’s not something you can do when you’re a trilateral amputee above the knee. It takes more energy to walk around, so you can’t be as heavy and must be leaner as it’s different to carry that weight around. “I used to live in the gym before my injury and it’s one of the things that pissed me off at the beginning; not thinking I’d be able to do it again. Luckily, I have a mate who owns a gym and gave me a key. I’d go in there at five in the morning for about six months because I was really conscious that – not because of looks because I couldn’t care less about that - but if I was in there when it was really busy, I’d have to get off it in between my sets whereas by myself, I could sit there and rest before doing my next lot. “I went in and spent those six months playing around with stuff and actually figured most of it out. Now I will go and train at any gym doing what I can with the exercises I’ve made up over the years. Some days my injuries can get to me in there, but I’m usually in there with my headphones on getting on with it. In the time since his injury, Mark has gone on to write the successful book ‘Man Down,’ which, funnily enough happened all too accidentally. 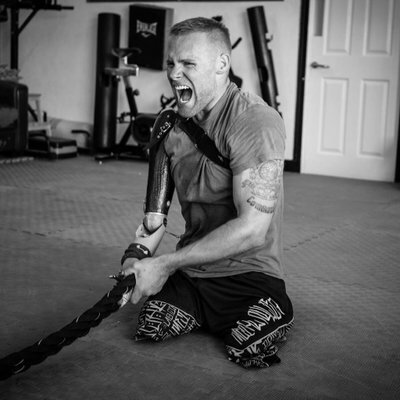 “When I was injured, I was the UK’s first triple-amputee from Afghanistan and there was a lot of media interest,” Ormrod informed. “During that time, I got to know a freelance journalist who worked with News of the World and we just said it as a joke, really, that we should write a book together. Mark with Prince Harry after the claiming silver medal in the rowing at the Invictus Games, 2017. Since his recouperation, Mark has turned his tragedy into a success story as he now works for the Royal Marines Association as a prime ambassador as well as helping others who may need assistance in achieving their goals of all kinds. No legs; no problem. Despite his tribulations, Ormrod believes his life now, at thirty-five-years-old, has a greater sense of achievement and purpose than what it had prior.